Just today I discovered this great web site. I enjoy sketch challenges so this is great for me. The Operation Write Home Memorial Day Blog Hop was a blast and I happened to have made a few purchases (!) 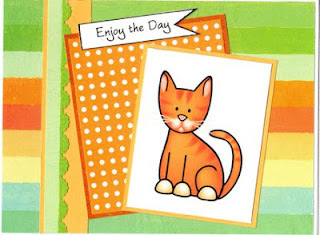 So, this was a chance to use one of my new colored digital stamps and a couple of old 12x12 patterned papers. This kitty is adorable!! Very pretty card!! This is darling! I love the bright colors, and the image is adorable! Thanks so much for sharing your card at Tuesday Morning Sketches! I'm so glad you found us, and hope you will join us again! What a sweet little kitty. Thanks for joining us at Tuesday Morning Sketches. Such a cute, cute image and so well colored. It reminds me of a kitty I once had (right color). Great use of our weekly sketch. Thank you for sharing with us at Tuesday Morning Sketches.